When the time comes to start your home lighting project, you’ll be faced with a wide range of fixture choices. From wall sconces to floor lamps, every room will rely on a unique combination of designer lighting products to deliver optimal illumination for all of your normal activities. While harking back to the luxury of the past, modern chandeliers now provide a wide range of benefits for Michigan homeowners. If you’re looking for indoor lighting in the Jenison area, The Lighting Corner is here to help! Our expansive lighting showrooms in Grandville and Grand Haven are suited to provide the products and expertise needed to outfit your home with quality. No matter your home’s size, style, or budget, our experienced staff is here and ready to create a personalized approach for your lighting budget. When used properly, chandeliers can help to set the mood of a room while bringing every design element together in a balanced manner. This light fixture has a lot of potential to enhance your property, but only when used correctly. Today, we’ll continue to highlight chandelier tips to help you create an amazing outcome for your Michigan home! While you can purchase a wide range of modern light bulbs to customize the brightness and color of your chandelier, it’s important to remember that different chandeliers produce different outputs of light. A multi-tier fixture without shades or medallions will produce a large amount of light while a mini-chandelier intended for the bedroom will provide quite the opposite. Remember that indoor lighting is all about balance, with a certain amount of lumens being preferable per square foot. Generally, homeowners can benefit best from three or four lumens per square foot. This rule is upsized to 300-400 lumens for every 100 square feet in your home. As room sizes change, so will the demands for illumination. Your lighting plan will need to account for your chandelier in relation to other fixtures being used in the room. Failing to properly calculate this equation can lead to a space that is either dangerously dim or uncomfortably bright. If you find yourself struggling to find an appropriate balance that allows for versatile lighting in different areas, dimmer switches are always a lifesaver! 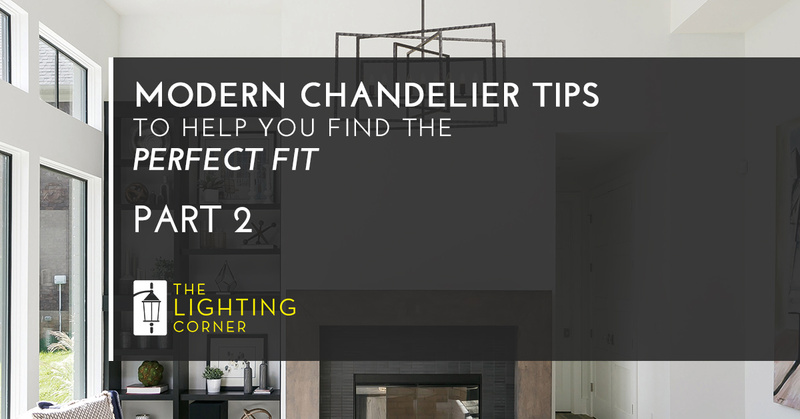 Modern chandeliers are now easier to care for than ever, but that does not mean that properly maintaining your fixture will be a walk in the park. The Lighting Center likes to provide comprehensive assistance to shoppers looking for the best home lighting, and part of our commitment stretches to the long-term convenience of your new chandelier. Different materials will require different cleaning procedures, with crystal chandeliers being among the most popular and sensitive choices. Be sure to investigate the upkeep demands for your chandelier choice, and always consider the full scope of maintenance demands before making a purchase. When properly cared for, your new chandelier will sparkle and shine for years to come. Regular cleaning tasks will help to optimize the appearance while minimizing upkeep on your end. Our lighting showroom has a wide range of materials to choose from, and our team will walk you through the needs of installing a new chandelier. Buying a modern chandelier can provide a wide range of benefits for your Michigan home. While this hanging light fixture is a beautiful choice, it’s important to remember that the best outcome only results from proper planning. Next time, we’ll continue to highlight a few simple tips that may help you when shopping for a chandelier. If you’re looking for top-quality indoor lighting for the Jenison area, be sure to stop by one of our lighting showrooms for expert assistance!